Adam Sandler is a daddy. HAHAHAHAHA! This funny thought is what the movie is based on and, as a result, the Big Daddy is what you would expect it to be: a blatantly awful, but funny, representation of juvenile parenting skills. However, to take the movie somewhere besides a few laughs, the plot attempts to weave in some sort of moral by the end. It was kind of lost on me. But I did laugh. And that's what people are going to see and remember this movie for. Adam Sandler is the perfect immature loser who can turn on the charm when needed (such as trying to get a girl). The kid, Julian (played by the twins Cole and Dylan Sprouse), who is sometimes called by his preferred name, Frankenstein, was cute, adorable, and funny. Which is what the movie called for, to be sure. However, what was somewhat disturbing to me about the film is the amount of cussing that this little boy had to recite. To me, this gave the movie a trashy quality, and made it seem insincere when the script attempted to bring maturity and a moral by the movie's end. However, what was most disturbing about the film was the ending credits. No, it wasn't the font of the actors' names or the speed of the scrolling; it was the music. Having Cheryl Crow sing her remix version of the Guns 'n' Roses' hit, Sweet Child Of Mine, was an insult to every fiber of every being in the galaxy. It completely SUCKED! Why not just replay the classic version? Why did they have to mess it up so bad? These are questions that will perhaps never be answered. It's funny. You could probably wait to see it on video though. 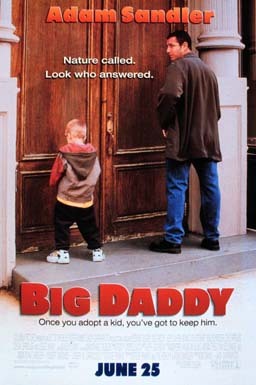 How would you rate the movie Big Daddy? There have been 18256 people to visit this page since Sat, Jul 17, 1999. And you are the first person to visit this page today!